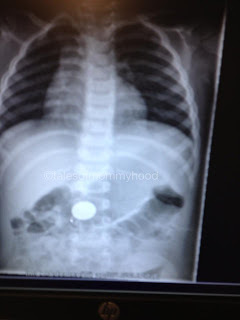 Just like the title of the post says, my kid ate a penny. Last night we were sitting in the family room, and I started to hear what sounded like metal clinking. I looked around, it stopped. I then heard it again, and as I looked at Mr. K - his hand was in his mouth and he had a really weird look on his face, and then he made a huge gulping/swallow sound - I asked if he was ok and he said "I ate money". I didn't panic (not my style) but I thought maybe I should call telehealth. After going through all their questions, she said that because I wasn't 100% sure it was a penny (because I hadn't actually seen it) I should have him assessed within 24 hours. Off to the walk-in we went this morning, the doc said that he needed an x-ray (again, because I wasn't 100% sure it was a penny) and that since it was Friday, she was sending us to emerg to have it done. The wait before getting an x-ray wasn't actually all that long - about 45 minutes from the time we walked in the door, waited to be triaged, then waited to be moved from that waiting room, to another room and then to xray. The longest part was after the x-ray - 2hrs45 minutes. 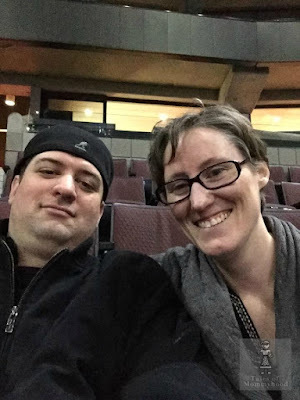 We saw the doctor, she showed us the x-ray and felt his belly; told us that it will pass on it's own and what to look out for in case it doesn't pass. The BEST part - she told me I DON'T have to check his diaper for it~! Oh my goodness, how scary! I would have been freaking out!!! Thank goodness he didn't choke! Thank goodness for not having to check his diaper! Yay for not having to check his diaper! That completely reminds me of when my sis was a baby and was on the kitchen counter and had managed to get the lid off a bottle of my Dad's prescription pills. My Mother bundled us all in the car and we rushed to the hospital and got her stomach pumped (I believe she was 2 or 3 at the time). When we got home, she noticed the remnants of the pills at the bottom of a bowl of water she had nearby to put cut veg in. My sister (now 29) has still not forgiven her! OMG - how scary. My kids got into their vitamins once and I had to call the poison centre. Luckily they only had a few each - so nothing to worry about. OMG that is so funny! When my youngest was in the hospital getting surgery for tonsils and adenoids, there was a little boy who was sharing our room. I never really asked what he was in for as he was happy and well, and had the same doc as us. I figured probably the same. Well when he came out of surgery, my boy was still super groggy, and he was super happy and giggling. They said "Do you want to see them??" I thought wth? they kept the tonsils??? LMAO but it turned out....he had stuck beads in his ear...not 1 but 2, and needed surgery to remove them! LOL They had them in a jar to keep. Glad you caught it before she swallowed it - thanks for stopping by. My second oldest swallowed 2 pennies. One of the news station was filming a segment about pediatrics ER that night. Yep, my 3 year old was on the news too. They did not use X-Rays but a metal detector to make sure the pennies were in the stomach. The doctor had us go to the airport about 5 days later to have them do another metal detector scan to verify that he passed it. LOL It was very scary at the moment but very common for toddlers.